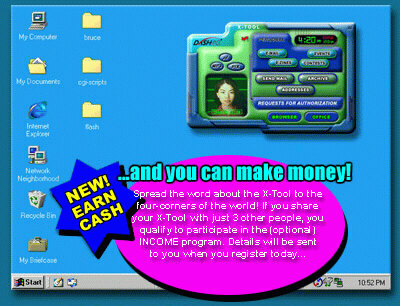 Register to download the amazing X-Tool... The X-Tool downloads to your computer and pops up with a click of a mouse! Exchange pictures, MP3's, and more... With the X-Tool Media Player you can play all kinds of media. X-Tool Users Log-In... Access your own Private Office to learn how to make money today. The X-Tool even comes equipped with an incredible Picture Gallery where you can exchange, archive and display your favorite pictures. Pictures can be displayed every which way. View one picture all the time, or a few in sequence. You can even display a collection of pictures randomly. In future editions of the X-Tool, you’ll be able to view pictures in real time so you can see who you’re talking to when you’re using the Dash Instant Messenger.